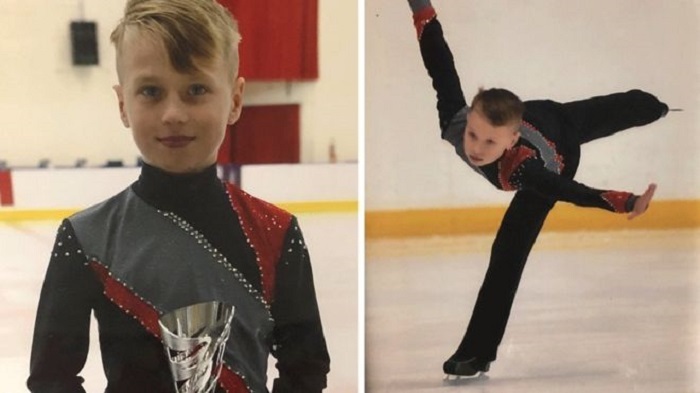 Ten-year-old Jayden Orr was a promising ice skater, training for the British Championships, when he suddenly collapsed on the ice rink. The leisure centre where he was skating had a life-saving defibrillator, but the person given training to use it was not there. Jayden, who had given his dad the thumbs up seconds before he collapsed, could not be saved. His family do not know if using the defibrillator could have saved him, but they are now raising money to have child-friendly defibrillators put into schools and are campaigning to make sure defibrillators are registered with the Scottish Ambulance Service. This will allow ambulance staff to direct members of the public to the nearest defibrillator to use until paramedics arrive. It is not clear exactly why Jayden, from Port Glasgow, suffered a cardiac arrest. His death, in August last year, was recorded as sudden death syndrome. His 20-year-old sister Kerri Lynn told the BBC Scotland news website: "He was a fit and healthy wee boy who had been ice skating for about four years. "That day he had been training for a competition and was his usual self. Two seconds after giving his dad the thumbs up he collapsed on the ice and that was it. "It was such a shock. It happened in seconds. We were absolutely heartbroken. "The fact that he was a healthy boy made it worse because there was no reason as to why it happened. "Using a defibrillator might have helped - you only have six minutes to save someone." The family started a campaign, Show Some Heart, to have defibrillators installed in all schools in Inverclyde, which they hope will extend to sports centres and other schools across Scotland. As well as setting up a Just Giving page, they created a charity, Jayden's Rainbow, and opened a charity shop in Greenock. "We have raised tens of thousands of pounds," Kerri said. "The Inverclyde community have been absolutely amazing. We have been overwhelmed by the support they have given us since the day it happened." Jayden's family have ordered their first 10 defibrillators, costing £1,500 each, which will go into schools in Inverclyde. They have also arranged for a trainer from Great Ormond Street Hospital to provide staff training. "We are getting defibrillators that are compatible with the ambulance service and have an adult or child button to press," Kerri said. "It then tells you where to place it on the child. Everyone could use it." Kerri said the family had since discovered that some defibrillators are accessible to the public but locked in cabinets. "You only have a few minutes so you don't have time to look for the key," she said. Her mother Kathleen, 42, added: "These defibrillators need to be accessible to members of the public. They are no good locked away. People also need to be trained to use them." Speaking about her son, she said: "Jayden was in seven competitions and had a podium place in all of them. He was training for the British Championships. "It was devastating losing a son, but we've kept ourselves really busy. The fundraising has kept us going. "We just want to let Jayden live on through helping other people." Kathleen, Kerri, her father John, 38, and 18-year-old brother Declan attended a member's debate on the campaign in the Scottish Parliament , led by MSP Stuart McMillan. What is a defibrillator and when should it be used? It is a device that gives a high energy electric shock to the heart through the chest wall and should be used when someone is in cardiac arrest. A cardiac arrest is when the heart stops pumping blood around the body. If someone has suddenly collapsed, is not breathing normally and is unresponsive, they are in cardiac arrest. Defibrillators are now commonplace in public areas such as train stations, shopping centres, airports and leisure centres. These defibrillators are often known as public access defibrillators (PAD) as anyone can use them in an emergency. The British Heart Foundation says that you should not be afraid to use a defibrillator if someone has had a cardiac arrest.